An improved sow in Hoima District in Uganda (photo credit: ILRI/Karen Marshall). Research conducted in Uganda’s smallholder pig value chains by the International Livestock Research Institute (ILRI) and partners in the past five years has revealed that pig production is constrained by poor pig genetics, a challenge that requires urgent addressing through institutional, research and farmer level action. The desire for genetically improved pigs in Uganda has been repeatedly expressed by a range of stakeholders including women and men smallholder pig keepers and other value chain actors (through previous projects by ILRI on the pig value chain in Uganda, and via local and national-level multi-stakeholder platforms established to support the pig sector). 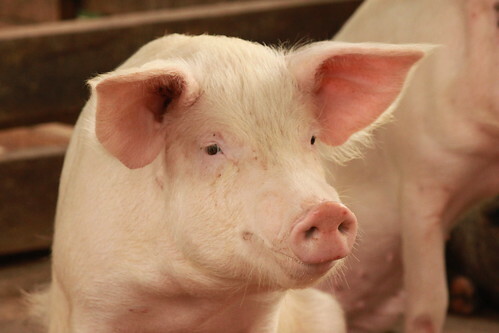 A newly launched Uganda pig genetics project seeks to increase the productivity and profitability of the country’s smallholder pig enterprises. It will do this through: identifying the most appropriate pig breed type(s); developing a genetic improvement strategy to ensure the availability and accessibility of genetically superior pigs; and supporting the uptake and optimal management of the genetically superior pigs by women and men smallholder pig keepers. Designing, with stakeholders, a genetic improvement strategy for the smallholder pig sector of Uganda, that produces pigs which meet the needs and preferences of their women and men pig keepers and other value chain actors, as well as market demand. Developing, with stakeholders, a scheme for registration of suppliers of pigs of known breed type/genetic quality and pilot-testing it. Building capacity of women and men pig keepers, as well as other stakeholders, on productivity and profitability of different household pig production systems and the identified genetic improvement strategy. Speaking at the launch of the project in July 2017, Karen Marshall, a researcher at ILRI and the project leader, said the project will enable farmers produce pigs which meet their needs and preferences as well as the market demand. ‘Attaining the most appropriate pig genetics for improved productivity and profitability of the Ugandan smallholder pig enterprises will be a good measure of success’, Marshall said. The three-year project is funded by the Austrian Development Agency (ADA) and will be led by ILRI in partnership with the National Animal Genetic Resources Centre & Databank (NAGRC&DB), Uganda and the University of Natural Resources and Life Sciences (BOKU) in Austria. From 10–14 July 2017, staff of ILRI, BOKU, NAGRC&DB and the International Center for Tropical Agriculture (CIAT) met with stakeholders of the pig value chains in Hoima and Lira districts. The meetings introduced the project and identified the specific sites where it will be implemented. The team also visited the Makerere University pig farm in Kabanyolo and the NAGRC&DB offices in Entebbe. Tags: ILRI Livestock Genetics Program. Bookmark the permalink. So is the study primarily investigating how to maximise output of local genetics in free range environments, or to introduce better (but more fragile) genetics into an intensive confined environment? I fear trying to do both will disseminate focus too widely. How can I join this program? Please contact the project leader, Karen Marshall, at k.marshall [at] cgiar.org. Thanks for your interest!